“Babylon hath been a GOLDEN CUP in the Lord’s hand, that made all the earth drunken: the nations have drunken of her wine; therefore the nations are mad” (Jer 51:7). *AMMIANUS MARCELLINUS compared with JUSTINUS, Historia and EUSEBIUS’ Chronicle. Eusebius says that Ninus and Semiramis reigned in the time of Abraham. 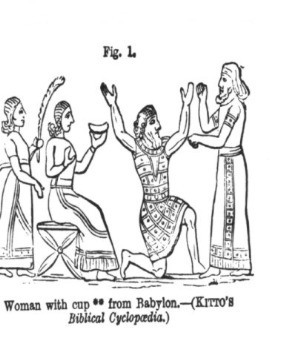 Thus was this Chaldean queen a fit and remarkable prototype of the “Woman” in the Apocalypse, with the golden cup in her hand, and the name on her forehead, “Mystery, Babylon the Great, the MOTHER of harlots and abominations of the earth.” (see Fig. 1) The Apocalyptic emblem of the Harlot woman with the cup in her hand was even embodied in the symbols of idolatry, derived from ancient Babylon, as they were exhibited in Greece; for thus was the Greek Venus originally represented, (see note 1 below) and it is singular that in our own day, and so far as appears for the first time, the Roman Church has actually taken this very symbol as her own chosen emblem. In 1825, on occasion of the jubilee, Pope Leo XII struck a medal, bearing on the one side his own image, and on the other, that of the Church of Rome symbolised as a “Woman,” holding in her left hand a cross, and in her right a CUP, with the legend around her, “Sedet super universum,” “The whole world is her seat.” (see figure 2) Now the period when Semiramis lived, —a period when the patriarchal faith was still fresh in the minds of men, when Shem was still alive, * to rouse the minds of the faithful to rally around the banner for the truth and cause of God, made it hazardous all at once and publicly to set up such a system as was inaugurated by the Babylonian queen. We know, from the statements in Job, that among patriarchal tribes that had nothing whatever to do with Mosaic institutions, but which adhered to the pure faith of the patriarchs, idolatry in any shape was held to be a crime, to be visited with signal and summary punishment on the heads of those who practised it. “If I beheld the sun,” said Job, “when it shined, or the moon walking in brightness; and my heart hath been secretly enticed, and * my mouth hath kissed my hand; this also were an iniquity to be punished by the judge; for I should have denied the God that is above” (Job 31:26-28). “THE MYSTERY OF INIQUITY DOTH ALREADY WORK” (2 Thess 2:7). 2. “Petronia, a priest’s wife, the type of modesty. In this place I lay my bones. Spare your tears, dear husband and daughter, and believe that it is forbidden to weep for one who lives in God.” (DR. MAITLAND’S Church in the Catacombs) A prayer here and there for the dead: “May God refresh thy spirit,” proves that even then the Mystery of iniquity had begun to work; but inscriptions such as the above equally show that it had been slowly and cautiously working, —that up to the period to which they refer, the Roman Church had not proceeded the length it has done now, of absolutely “forbidding its priests to ‘marry.’” Craftily and gradually did Rome lay the foundation of its system of priestcraft, on which it was afterwards to rear so vast a superstructure. At its commencement, “Mystery” was stamped upon its system. But this feature of “Mystery” has adhered to it throughout its whole course. When it had once succeeded in dimming the light of the Gospel, obscuring the fulness and freeness of the grace of God, and drawing away the souls of men from direct and immediate dealings with the One Grand Prophet and High Priest of our profession, a mysterious power was attributed to the clergy, which gave them “dominion over the faith” of the people —a dominion directly disclaimed by apostolic men (2 Cor 1:24), but which, in connection with the confessional, has become at least as absolute and complete as was ever possessed by Babylonian priest over those initiated in the ancient Mysteries. The clerical power of the Roman priesthood culminated in the erection of the confessional. That confessional was itself borrowed from Babylon. The confession required of the votaries of Rome is entirely different from the confession prescribed in the Word of God. The dictate of Scripture in regard to confession is, “Confess your faults one to another” (James 5:16), which implies that the priest should confess to the people, as well as the people to the priest, if either should sin against the other. This could never have served any purpose of spiritual despotism; and therefore, Rome, leaving the Word of God, has had recourse to the Babylonian system. In that system, secret confession to the priest, according to a prescribed form, was required of all who were admitted to the “Mysteries”; and till such confession had been made, no complete initiation could take place. Thus does Salverte refer to this confession as observed in Greece, in rites that can be clearly traced to a Babylonian origin: “All the Greeks, from Delphi to Thermopylae, were initiated in the Mysteries of the temple of Delphi. Their silence in regard to everything they were commanded to keep secret was secured both by the fear of the penalties threatened to a perjured revelation, and by the general CONFESSION exacted of the aspirants after initiation —a confession which caused them greater dread of the indiscretion of the priest, than gave him reason to dread their indiscretion.” This confession is also referred to by Potter, in his “Greek Antiquities,” though it has been generally overlooked. In his account of the Eleusinian mysteries, after describing the preliminary ceremonies and instructions before the admission of the candidates for initiation into the immediate presence of the divinities, he thus proceeds: “Then the priest that initiated them called the Hierophant, proposed certain QUESTIONs, as, whether they were fasting, &c., to which they returned answers in a set form.” The etcetera here might not strike a casual reader; but it is a pregnant etcetera, and contains a great deal. It means, Are you free from every violation of chastity? and that not merely in the sense of moral impurity, but in that factitious sense of chastity which Paganism always cherishes. Are you free from the guilt of murder? —for no one guilty of slaughter, even accidentally, could be admitted till he was purged from blood, and there were certain priests, called Koes, who “heard confessions” in such cases, and purged the guilt away. The strictness of the inquiries in the Pagan confessional is evidently implied in certain licentious poems of Propertius, Tibullus, and Juvenal. Wilkinson, in his chapter on “Private Fasts and Penance,” which, he says, “were strictly enforced,” in connection with “certain regulations at fixed periods,” has several classical quotations, which clearly prove whence Popery derived the kind of questions which have stamped that character of obscenity on its confessional, as exhibited in the notorious pages of Peter Dens. The pretence under which this auricular confession was required, was, that the solemnities to which the initiated were to be admitted were so high, so heavenly, so holy, that no man with guilt lying on his conscience, and sin unpurged, could lawfully be admitted to them. For the safety, therefore of those who were to be initiated, it was held to be indispensable that the officiating priest should thoroughly probe their consciences, lest coming without due purgation from previous guilt contracted, the wrath of the gods should be provoked against the profane intruders. This was the pretence; but when we know the essentially unholy nature, both of the gods and their worship, who can fail to see that this was nothing more than a pretence; that the grand object in requiring the candidates for initiation to make confession to the priest of all their secret faults and shortcomings and sins, was just to put them entirely in the power of those to whom the inmost feelings of their souls and their most important secrets were confided? Now, exactly in the same way, and for the very same purposes, has Rome erected the confessional. Instead of requiring priests and people alike, as the Scripture does, to “confess their faults one to another,” when either have offended the other, it commands all, on pain of perdition, to confess to the priest, * whether they have transgressed against him or no, while the priest is under no obligation to confess to the people at all. * BISHOP HAY’S Sincere Christian. In this work, the following question and answer occur: “Q. Is this confession of our sins necessary for obtaining absolution? A. It is ordained by Jesus Christ as absolutely necessary for this purpose.” See also Poor Man’s Manual, a work in use in Ireland. Without such confession, in the Church of Rome, there can be no admission to the Sacraments, any more than in the days of Paganism there could be admission without confession to the benefit of the Mysteries. Now, this confession is made by every individual, in SECRECY AND IN SOLITUDE, to the priest sitting in the name and clothed with the authority of God, invested with the power to examine the conscience, to judge the life, to absolve or condemn according to his mere arbitrary will and pleasure. This is the grand pivot on which the whole “Mystery of iniquity,” as embodied in the Papacy, is made to turn; and wherever it is submitted to, admirably does it serve the design of binding men in abject subjection to the priesthood. In Pausanias we find an account of a goddess represented in the very attitude of the Apocalyptic “Woman.” “But of this stone [Parian marble] Phidias,” says he, “made a statue of Nemesis; and on the head of the goddess there is a crown adorned with stags, and images of victory of no great magnitude. In her left hand, too, she holds a branch of an ash tree, and in her right A CUP, in which Ethiopians are carved.” (PAUSANIAS, Attica) Pausanias declares himself unable to assign any reason why “the Ethiopians” were carved on the cup; but the meaning of the Ethiopians and the stags too will be apparent to all who read further. We find, however, from statements made in the same chapter, that though Nemesis is commonly represented as the goddess of revenge, she must have been also known in quite a different character. Thus Pausanias proceeds, commenting on the statue: “But neither has this statue of the goddess wings. Among the Smyrneans, however, who possess the most holy images of Nemesis, I perceived afterwards that these statues had wings. For, as this goddess principally pertains to lovers, on this account they may be supposed to have given wings to Nemesis, as well as to love,” i.e., Cupid. The giving of wings to Nemesis, the goddess who “principally pertained to lovers,” because Cupid, the god of love, bore them, implies that, in the opinion of Pausanias, she was the counterpart of Cupid, or the goddess of love —that is, Venus. While this is the inference naturally to be deduced from the words of Pausanias, we find it confirmed by an express statement of Photius, speaking of the statue of Rhamnusian Nemesis: “She was at first erected in the form of Venus, and therefore bore also the branch of an apple tree.” (PHOTII, Lexicon) Though a goddess of love and a goddess of revenge might seem very remote in their characters from one another, yet it is not difficult to see how this must have come about. The goddess who was revealed to the initiated in the Mysteries, in the most alluring manner, was also known to be most unmerciful and unrelenting in taking vengeance upon those who revealed these Mysteries; for every such one who was discovered was unsparingly put to death. (POTTER’S Antiquities, “Eleusinia”) Thus, then, the cup-bearing goddess was at once Venus, the goddess of licentiousness, and Nemesis, the stern and unmerciful one to all who rebelled against her authority. How remarkable a type of the woman, whom John saw, described in one aspect as the “Mother of harlots,” and in another as “Drunken with the blood of the saints”! The period over which the dynasties of Manetho extend, beginning with Menes, the first king of these dynasties, is in itself a very lengthened period, and surpassing all rational belief. But Bunsen, not content with this, expresses his very confident persuasion that there had been long lines of powerful monarchs in Upper and Lower Egypt, “during a period of from two to four thousand years,” even before the reign of Menes. In coming to such a conclusion, he plainly goes upon the supposition that the name Mizraim, which is the Scriptural name of the land of Egypt, and is evidently derived from the name of the son of Ham, and grandson of Noah, is not, after all, the name of a person, but the name of the united kingdom formed under Menes out of “the two Misr,” “Upper and Lower Egypt,” which had previously existed as separate kingdoms, the name Misrim, according to him, being a plural word. This derivation of the name Mizraim, or Misrim, as a plural word, infallibly leaves the impression that Mizraim, the son of Ham, must be only a mythical personage. But there is no real reason for thinking that Mizraim is a plural word, or that it became the name of “the land of Ham,” from any other reason than because that land was also the land of Ham’s son. Mizraim, as it stands in the Hebrew of Genesis, without the points, is Metzrim; and Metzr-im signifies “The encloser or embanker of the sea” (the word being derived from Im, the same as Yam, “the sea,” and Tzr, “to enclose,” with the formative M prefixed). If the accounts which ancient history has handed down to us of the original state of Egypt be correct, the first man who formed a settlement there must have done the very thing implied in this name. Diodorus Siculus tells us that, in primitive times, that which, when he wrote, “was Egypt, was said to have been not a country, but one universal sea.” Plutarch also says (De Iside) that Egypt was sea. From Herodotus, too, we have very striking evidence to the same effect. He excepts the province of Thebes from his statement; but when it is seen that “the province of Thebes” did not belong to Mizraim, or Egypt proper, which, says the author of the article “Mizraim” in Biblical Cyclopoedia, “properly denotes Lower Egypt;” the testimony of Herodotus will be seen entirely to agree with that of Diodorus and Plutarch. His statement is, that in the reign of the first king, “the whole of Egypt (except the province of Thebes) was an extended marsh. No part of that which is now situate beyond the lake Moeris was to be seen, the distance between which lake and the sea is a journey of seven days.” Thus all Mizraim or Lower Egypt was under water. When we see that Menes, the first of the acknowledged historical kings of Egypt, accomplished that very achievement which is implied in the name of Mizraim, who can resist the conclusion that menes and Mizraim are only two different names for the same person? And if so, what becomes of Bunsen’s vision of powerful dynasties of sovereigns “during a period of from two to four thousand years” before the reign of Menes, by which all Scriptural chronology respecting Noah and his sons was to be upset, when it turns out that Menes must have been Mizraim, the grandson of Noah himself? Thus does Scripture contain, within its own bosom, the means of vindicating itself; and thus do its minutest statements, even in regard to matters of fact, when thoroughly understood, shed surprising light on the dark parts of the history of the world.